Fernando Perez is an Evangelist from the nation of Brazil who has a passion to see souls being saved, healed, delivered and restored for the glory of God. Fernando was born in a Catholic home but never had the desire to attend, or have any involvement, with church. His passion was to play futebol, or “soccer”. In fact, one of his biggest dreams as a young man was to be a professional soccer player. However, God had different plans for him. In 1993, Fernando received an invitation from his brother, Andrew, to attend a Pentecostal church nearby. He accepted the invitation and, ever since that day, has never stopped attending church. On August 28, 1994, he was baptized in water, publicly confessing his faith as a new creature in Jesus Christ in the presence of a multitude of people. From that time onward, he began to seek the Lord intensely, praying on prayer mountains for hours at a time, spending many nights at prayer vigils and evangelizing the lost souls in his neighborhood. In 2001, during a church service in Brazil, Fernando received a word of prophecy that changed his life. The prophetic word came forth saying that God had chosen him to become a full-time minister and his calling was to take the Gospel to the nations of the world. Within the same year, he received an invitation to attend a school of ministry in Elk Grove, California where he soon relocated. Since 2003, Fernando has helped thousands of precious souls around the world through his Healing and Deliverance ministry, online prayer campaigns, Skype counseling ministry and his revival conferences in the United States. Fernando carries a strong anointing for miracles and signs and wonders follow him regularly. On June 12, 2015, Fernando had an incredible experience which changed his life and enlarged his vision of the ministry. By divine appointment, Fernando met Prophet Gabriel Teixeira from the nation of Brazil. Prophet Teixeira was moved by the Holy Spirit to lay hands on and anoint Fernando with oil, thereby imparting the anointing that is so evident in his own ministry. Specifically, the Prophet asked God for the activation of the nine gifts of the Holy Spirit to be activated in Fernando’s ministry just as they were active in his own ministry. Since that day, Fernando’s ministry has never been the same. The ministry has witnessed an increase in miracles along with all types of healing, accurate prophecies, discernment of spirits and words of knowledge all increasing for the glory of God! Fernando’s wife, Priscilla Perez, is an anointed worshiper and teacher of the Word. Preaching with passion and power, Priscilla has a passion for purity and intimacy with God. Her heart’s desire is to see this generation walking in purity and knowing their true identity and destiny in Christ. 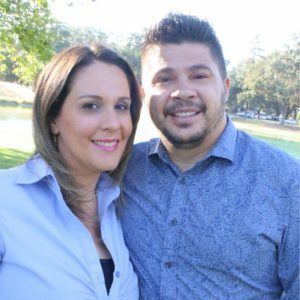 Fernando and Priscilla live in Sacramento, California, and work together in the ministry with a burning passion to change the lives of thousands through the Gospel of Jesus Christ. Our mission is to reach the lost and to witness the Gospel to every creature by proclaiming that Jesus is the only way, the truth and the life (John 14:6). We seek to make a difference through offering a vibrant online ministry, providing training seminars and revival conferences, and connecting people to the local church where they will grow and mature spiritually to be true followers of Christ. We believe in the deity of the Lord Jesus Christ, in His virgin birth, in His sinless life, in His miracles, in His atoning death through His shed blood on the cross, in His bodily resurrection, in His ascension to the right hand of the Father, and in His personal return in power and glory. Matthew 1:23; John 1:1-4 and 1:29; Acts 1:11 and 2:22-24; Romans 8:34; 1 Corinthians 15:3-4; 2 Corinthians 5:21; Philippians 2:5-11; Hebrews 1:1-4 and 4:15.